The College Checklist Podcast: College Admissions, Financial Aid, Scholarships, Test Prep, and more. Confused about the road to college? Don't know where to begin your college search? The College Checklist podcast is your source for great information on the college admissions journey. 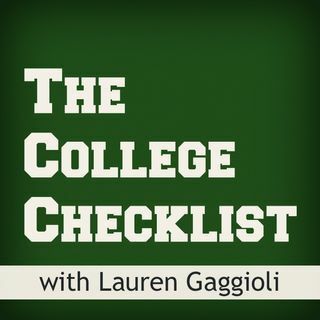 Hosted by SAT & ACT expert and entrepreneur Lauren Gaggioli, the College Checklist features interviews from college counselors, admission officers and other professionals who can help you get into college, pay for school with scholarships, and succeed once you're there. This podcast also features ... See More test prep tips and tricks and alerts for dates and deadlines for upcoming ACT & SAT test dates. The College Checklist podcast is your source for all things college admissions. The College Checklist podcast is brought to you as a free service of Higher Scores Test Prep, an online test prep company that helps students prepare for the SAT and ACT. All About Student Loans (Episode 92) - The College Checklist Podcast: College Admissions, Financial Aid, Scholarships, Test Prep, and more..